Searching for the right tires that provide comfort, durability, and top quality performance seems like a difficult task at hand, but the Statesboro tire experts at D & R are here to help you through the process. One of the best tire plans that offer an additional measure of safety and confidence is the Continental Tire Total Confidence Plan. 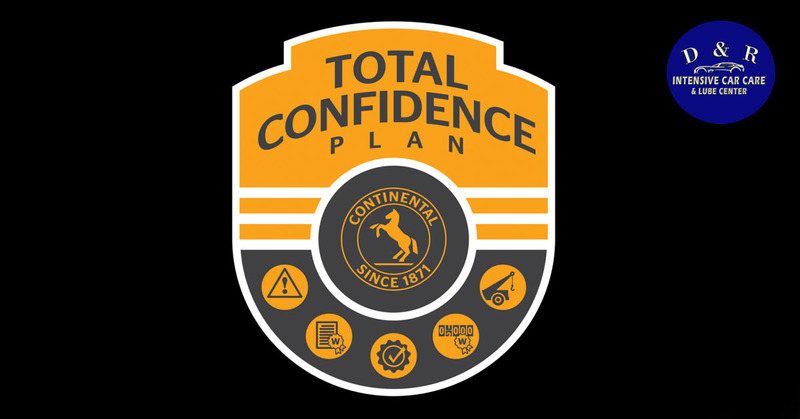 When you purchase Continental brand tires, you also receive the support and benefits of the Total Confidence Plan. The Total Confidence Plan is an all-inclusive package of warranties and services including: Limited Warranty, Flat Tire Roadside Assistance, Customer Satisfaction Trial, Mileage Warranty (if applicable), and Road Hazard Coverage. Receive up to three years of courtesy flat change or towing up to 150 miles at no charge. To obtain the roadside assistance, your tires must be registered online at www.totalconfidence-plan.com within 45 days of purchase. Once registered your Flat Tire Roadside Assistance Card along with program terms and conditions will be emailed to you. The Road Hazard Coverage applies to all Continental passenger and light truck tires that are purchased as replacement, and provides a similar replacement tire within the first 12 months. Continental passenger and light truck tires purchased as replacement bearing the Continental name and D.O.T. serial numbers are covered up to 60 days (30 days for winter and select marketing lines). All Continental passenger and light truck tires are eligible for the Limited Warranty for a maximum of up to 72 months from the date of purchase. The Limited Warranty also permits free replacement within the first 12 months. Receive coverage on select replacement products up to 90,000 miles. If you are shopping for tires, please stop by or schedule an appointment online. We have a team of tire experts ready to serve you and help you find the perfect brand to meet all of your tire needs.